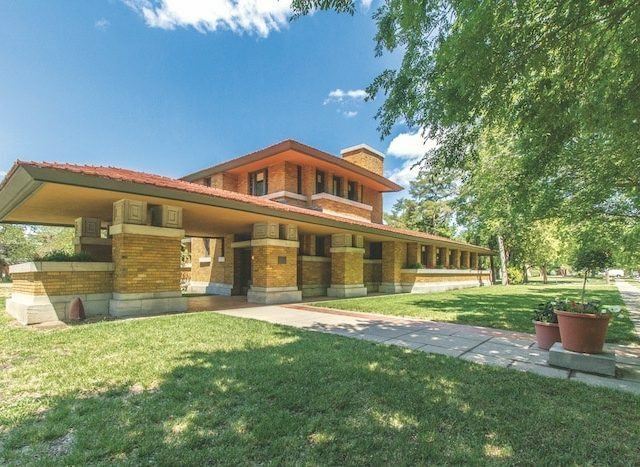 This Usonian home gets its two names from two separate owners, who both contracted Frank Lloyd Wright for their homes. Home rental open to the public. In 1939, Wright designed a 900 square foot home for Clarence Sondern in the Roanoke neighborhood of Kansas City, Missouri. Three squares connected the two wings of the L-shaped home with a workspace, laundry/heater room, and bathroom. There were two bedrooms, both with glass doors and openings to the terrace. Nine years later, Arnold Adler, the second owner of the home, once again called upon Wright to design the addition to the home that would add on more than 2,000 square feet, which included another bedroom, additional bathrooms, additional living spaces and a carport.